What better idea than to get some tacos and margaritas in Lincoln Park after watching the Cubs miserably lose to the sox. Erica was craving some guacamole and margarita so we picked Taco Joint after hearing about it, having a drink deck coupon and not being close enough to Big Star at the time. The name is quite fitting for the concept because it is a very small and cozy taquería with a large bar in the front and communal tables in back. Service is fast and friendly and pricing is appropriate ($2-4 tacos, $8 margs). I would not hail these as the best tacos in the city (and my preference is still big star or mercadito) but for the crowd looking for quick eats or late night taco craving, there's nothing else around Armitage/Halstead that can meet you needs as well. I wouldn't make a trip across town for Taco Joint but they do the trick with reliable and safe options at reasonable prices with good drinks. 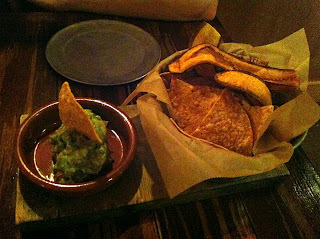 We each ordered the house "Zocalo" Margarita and really liked it for not being too sweet and easy to drink. The single guacamole was our favorite dish and could have ordered a double easily. The chips are funky because they include other vegetable chips besides corn. I asked for a side of hot salsa and it was true to form - very hot and quite tasty. The four tacos we tried were the ceviche, pancita, cochinita and tinga - with pancita the special of the day, braised pork belly. 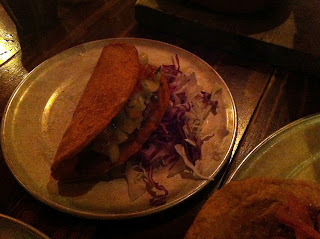 I thought all the tacos were fine but lacked nice flavors in the meat, even with nice toppings and sauce. 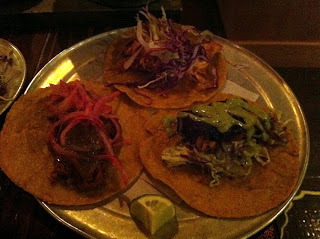 The cochinita or tinga (chicken) were my favorites when hot sauce is included. There are other items on the menu that look fun to try like tortas, gorditas and antojitos. Again, it's a nice and fun spot in the middle of LP for quick meals or late night cravings. Good drinks and decent food at reasonable prices.